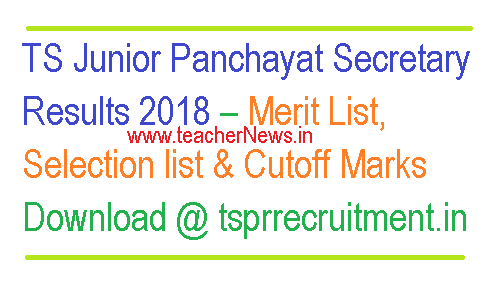 TS Junior Panchayat Secretary Results 2018 Merit List, Cutoff Marks Download @ tsprrecruitment.in : Telangana Junior Panchayat Secretary Result, TS Panchayat Secretary Result, TS Junior Panchayat Secretary Selection List Download. TS Panchayat Secretary Exam Results Download @tsprrecruitment.in. Telangana Junior Panchayat Secretary Results 2018-19 — TSPRRE 2018 Exam Result, Cutoff Marks. Telangana Junior Panchayat Secretary Recruitment Exam Results to be released on 25th October 2018 at official web portal www.tsprrecruitment.in, officials said. Telangana Junior Panchayat Secretary written test conducts on 10th October for a large number of applicants in Paper 1 & Paper 2. Great News from Officials on Telangana Panchayat Secretary Recruitment Exam Results for the candidates who have appeared the exam held on 10th October 2018 to fill up 9335 vacant posts in Panchayat Raj Dept of Telangana StateTelangana State Panchayat Raj Department is going to release selection list/ Merit List with Marks for Junior Panchayat Secretary vacancies. Telangana Panchayat Secretary Result 2018 Cut off Marks TSPSC - Check TS Panchayat Secretary Result 2018 TSPRI Cut off Marks, Certificate Verification dates @ tsprrecruitment.in.